Welcome to Flashback Friday! Today I am featuring a retired My Reflections paper packet called Hooligans. 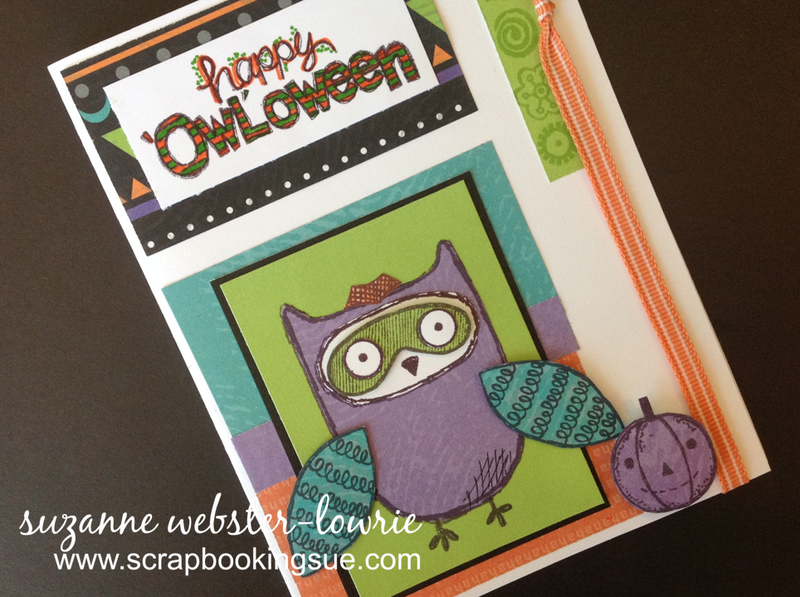 Since the August Stamp of the Month is Halloween-themed, I thought that these papers would work perfectly with this Halloween owl! This 5.5″ x 4.25″ card was made with a White Daisy cardstock base and various pieces of patterned paper from the Hooligans packet. The color palette for this card was: Gypsy (purple), Pear (green), Sunset (Orange), Lagoon (blue), Black, and White Daisy. 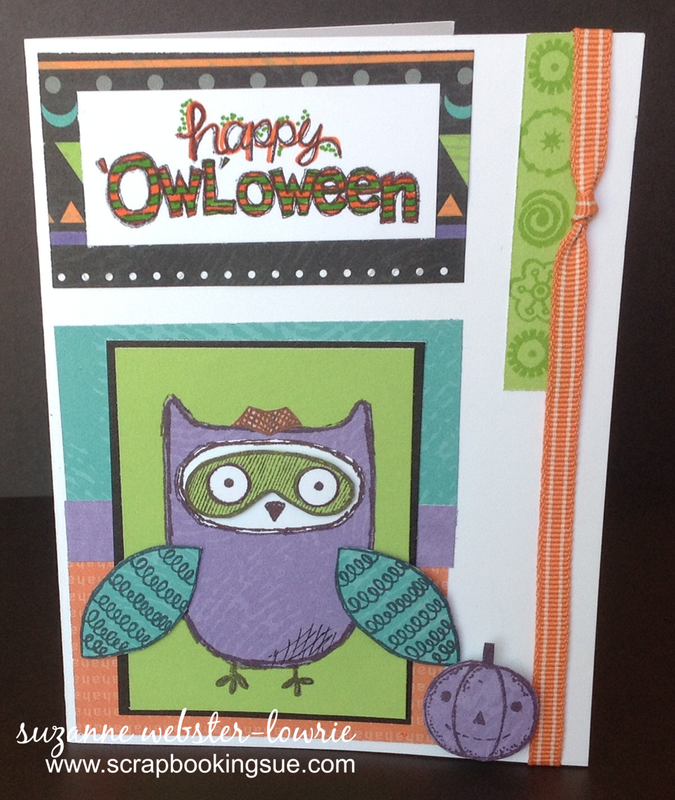 The stamp set used for this project is the August featured Stamp of the Month, “What a Hoot.” The “Happy ‘Owl’oween” sentiment was stamped in black ink and then colored in with orange and green markers. 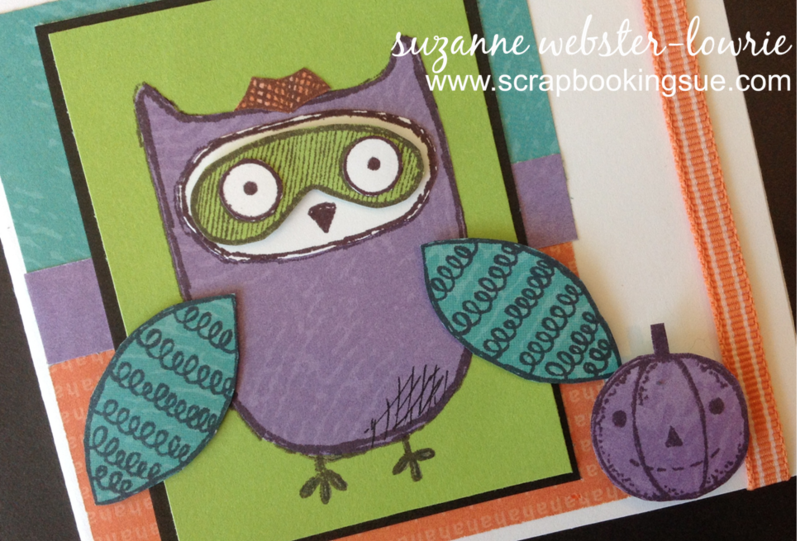 The owl was stamped in different components and then paper pieced together. This particular owl did not come with any feet, whereas the other owl in this set came with a set of long legs and feet. Wanting my owl to have feet, I used the masking technique and stamped just the feet from the other owl onto this little guy. I used thin foam tape to pop up the wings and mask slightly, and regular foam tape to pop up the pumpkin even more. I added a little bit of crosshatching to the lower portion of the owl’s body to break up some of the purple. The green strip at the top of the card was stamped with various designs from the stamp set. The orange ribbon is also retired from CTMH. This is such a cute stamp set! You can own this for only $5 with your qualifying purchase of $50. Please go HERE for more information, or to purchase.